Tonight we went to the Radio8Ball show with Andras Jones and Jon as the musical guest. The premise of the show is that everyone in the audience places a question in a box. The questions are chosen at random. Not every question gets picked, but as luck would have it, last night my question was picked second! 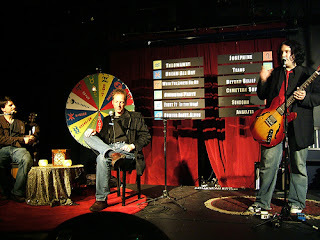 So I had to get up on stage, ask my question and spin the wheel. My question was: Should I go back to school this year? Missed this one and want to catch the next show?